3Camel and rider, ca. 700 B.C. Long before Greek and Roman antiquity laid the foundations for Western culture, high civilizations were emerging in the Orient, particularly in the fertile "land between the rivers"�Mesopotamia. One of the most important preconditions for the development of such advanced cultures was the development of agriculture and livestock breeding, as both of these demanded increasing investment in organizational structures. The early history of the Ancient Orient was also shaped by the immigration and settlement of 1 nomad peoples. The relationship between the nomads and the settled peoples was long regarded in terms of certain tribes conquering the lands of others. However, the immigration of small tribes often occurred over the course of centuries and was more of an infiltration. A mutual permeation of culture and religion took place, but so did conflicts over natural resources such as grazing land and water for irrigation. 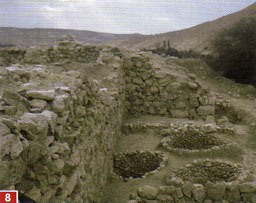 The transition from small-animal husbandry to 2 livestock breeding contributed significantly to the settling of nomadic tribes in the Near East. Cattle�which were incorporated into religion as 4 cult symbols for strength and fertility�were used as draft animals as well as farm and pasture animals. The donkey and particularly the 3 camel were also domesticated for riding and as pack animals. The camel became the main form of transportation in the caravan trade, while horses were used primarily in warfare. 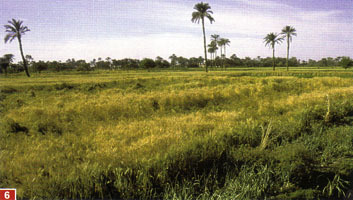 Wheat and barley were the main crops cultivated. The invention of the field plow, cleverly devised 6 irrigation systems, and dams and canals to protect against floods all increased efficiency and production within the settlements. The other important task of the growing communities was defense against outside enemies who were competing for resources. The increasing number and complexity of tasks led to social differentiation between farmers, 5, 11 craftsmen, warriors, and administrators. In addition, there were 7 priests who performed religious rites and also attempted to determine the favorable times for sowing and harvest through calculations, prophecies, and astrology. 5 Engraving of carpenter, Babylon, second-third �. �.�. 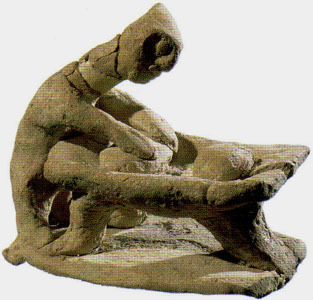 11 Statuette of a baker, ninth eighth century B.C. Early communities eventually developed into strictly hierarchical class-based societies. The officials, as administrative specialists, held a key position. They controlled the municipal trade and agrarian production. Central 8 grain silos were usually placed in religious structures, and for this reason it is assumed that the state's property and administration was also concentrated here (that is, a "temple economy"). The ruler, a king or city prince, had a special role. He was the initiator of communal work projects as well as the head of administrative and religious activities. He administered the land in the name of the gods and acted as their earthly representative. 12 Religion in Mesopotamia was very complex and, as a result of the steady arrival and settlement of nomadic peoples, new elements were constantly added, and others changed over time, thus testifying to its integrative capacity. Various local heroes, such as Gilgamesh of Uruk (ca. 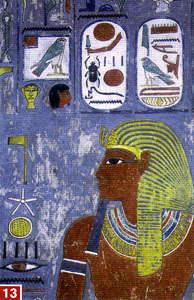 2700-2600 B.C. ), or city tutelary deities, such as Marduk in Babylon, rose to prominence in the pantheon of the gods with the support of the community. For example, Marduk was declared chief god under Hammurapi of Babylon (1792-1750 B.C.). The Achaemenid ruler Cyrus the Great accepted the acclamation of the Marduk priesthood in Babylon and thereby renewed the Babylonian Kingdom. After his victory over Darius III in the battle at Gaugamela, Alexander the Great paid tribute to the city god Marduk in 331 B.C. His rule thereby acquired an element of divine legitimacy. In this way the conqueror made himself the successor of the Babylonian kings. The change in the cultural development of man that resulted from the invention of writing cannot be overestimated. The earliest known script has been found on small clay tablets that were used in 10 commercial transactions. Early Sumerian cuneiform writing developed out of pictographs in which�as in Egyptian 13 hieroglyphics�the pictograph resembled the object it was meant to represent. It was a complicated system that was mastered only by specially trained scribes who therefore had a powerful position within the social hierarchy. 10 Trade record in cuneiform script, ca. second �. �. Pictographs differed from the earlier symbols and paintings by cavemen because they relied on the systematic coherency of the writing, rather than oral tradition, for the transmission of meaning. The desire to simplify writing led from pictographs to cuneiform script. Characte pressing a sound or a group of sounds replaced the object symb and word-phonetic spelling developed. At first a syllabary : emerged in which a character represented a single syllable or com syllables. Around 2500 B.C., the Akkadians adopted Sumerian syllable writing, which already existed in cuneiform, and expanded it with their own characters. Later, the Elamites, Hurrites, Hittites, Urartians, and other peoples adopted this writing system, and by 1400 B.C. it was in use as the common script for international trade. The most abstract step in the development of writing was the creation of an alphabetic script assigning characters to sounds. With this method, an unlimited number of combinations can be formed with a small number of phonetic characters. 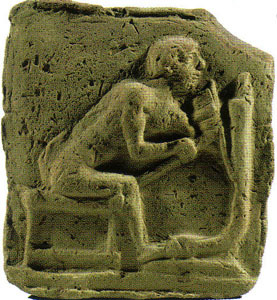 The first scripts composed purely of phonetic characters were developed in the Canaanite metropolises of Ugarit (ca. 1400 B.C.) and 9 Byblos (ca. 1000 B.C. ), with alphabets of 30 and 22 letters, respectively. Like all Semitic script, the alphabets of the Canaanites and their successors, the Phoenicians�which became the foundation for Israelite, Syrian, Arabic, and Greek alphabets�had no vowels. as their use as numeric symbols. The oldest Greek texts are also written, like the old Semitic texts, from right to left. While urban culture was emerging in the Near East, mass 2 migrations began to take place in Asia. In some cases, these continued for well over a thousand years� lasting longer than the migrations of late antiquity. From 3000 B.C. 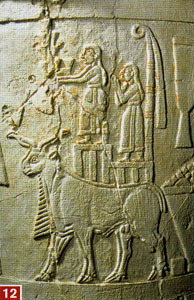 onward, Semitic peoples from the south and Indo-European peoples from the north migrated into Mesopotamia. At the beginning of the first millennium B.C., the appearance of these seagoing and equestrian peoples triggered great turmoil. 2 Semitic nomads, Egyptian painting, 19th century B.C. In approximately 3000 B.C., a shift of power took place in the Near East as the result of the immigration of Semitic and Indo-European tribes into the area. Out of Arabia, Semitic tribes pushed in several waves into the area of the "Fertile Crescent"� that crucial swath of land reaching from Mesopotamia over the coasts of the Eastern Mediterranean and into Egypt. 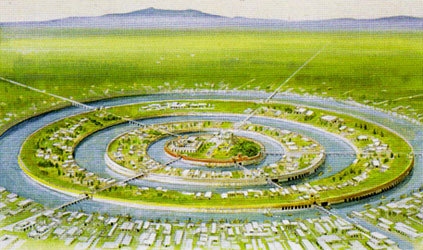 Around 2400 B.C. 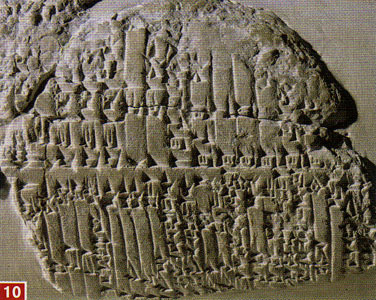 the Semitic Akkadians subjugated the Sumerian city-states and created an empire. The Canaanites settled in Palestine and founded city-states, as did the Amorites in Syria. The Amorites also established the first dynasty of Babylon and ruled the old Babylonian Empire. In the 13th century B.C. the Aramaeans, Semitic ancestors of the Israelites , appeared on the scene. They won control from the Assyrians in Syria and Palestine (in the kingdoms of David and Solomon, for example), increasing their influence in Mesopotamia after 1100 B.C. The Aramaic Chaldeans ultimately defeated the Assyrians and founded the Neo-Babylonian Kingdom (625-539 B.C.). Paralleling this Semitic migration, Iranian Indo-European peoples moved through the 1 Caucasus into Mesopotamia, beginning with the Gutian invasion in 2150 B.C. that dissolved the Akkadian empire. The Hurrites made up the upper class in the Mitanni kingdom (16th-14th century B.C. ), which was eventually conquered by the Hittites, an Indo-European tribe that settled in Asia Minor around 2000 B.C. The Kassites, who had moved down from Iran, ruled Mesopotamia from about 1530 to 1160 B.C. The various "peoples" and "tribes" were never clearly defined or distinguishable units. 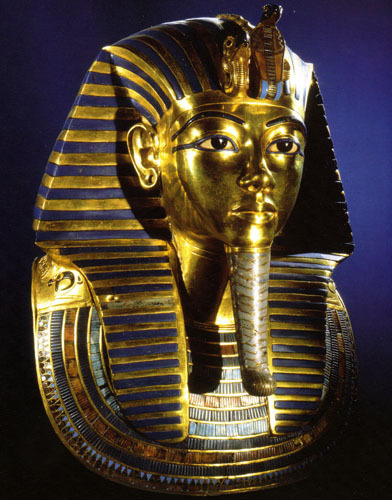 It is assumed that the Hyksos, for example, who invaded Egypt in 1650 B.C., were composed of both Semitic peoples and Indo-European Hurrites. But even the divisions "Semitic" and "Indo-European" are based on the script and languages used by these groups and give little information as to the ethnic composition or indeed precise geographical origins of the tribes they are ascribed to. The Persians and the Medes were not part of this first migration but belong to a later wave of Indo-European migration into the region that occurred in the second century. "Abraham's Exodus," copperplate engraving, 17th century a.d.
Abraham's story (Genesis 11:10-25:11) mirrors the migration of the Aramaic nomads: In the second half of the second millennium B.C., Abraham led his tribe out of Mesopotamia at God's behest and into Palestine, where they settled despite the resistance of the previous inhabitants. In the traditional Islamic version, he led them to Mecca, where he constructed the Ka'aba and founded the pilgrimage tradition. 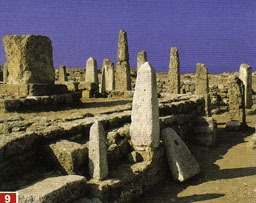 Around 1200 B.C., the Eastern Mediterranean area experienced great changes. Neither high civilizations, such as the Hittite empire, nor civilizations like the Mycenaeans, Minoans, or Canaanites were a match for the advance of the sea and equestrian peoples. 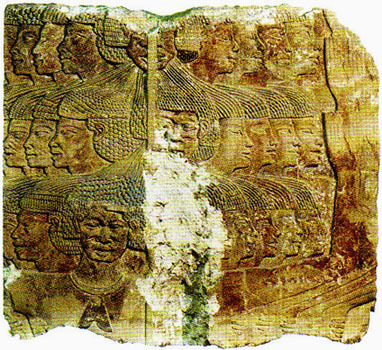 The term "sea peoples." which appears in Egyptian and Hittite sources from around 1300 B.C. onward, refers collectively to diverse foreign tribes. Controversy still exists as to their origins. Speculation has traced them to Illyria (today's Croatia and Slovenia) but also to Asia Minor and the Aegean area. The 4 seagoing people at first spread fear among the settled trading tribes, until they�like the Philistines�permanently settled. The Philistines conquered the coastal region of Palestine and Syria and destroyed the Canaanite city-states. 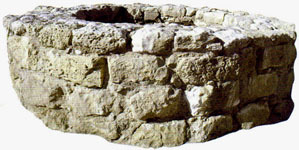 This facilitated the immigration of the Israelites. The migratory movements of the Greeks, Thracians, Phrygians, and Lydians fit into this pattern of sea peoples' migrations. The Greeks coming out of the Balkans and invading present-day Greece destroyed the cultures of the Mycenaeans and 3 Minoans. The Hittite empire also went under with the onslaught of the seagoing tribes. The Thracians, Phrygians, and Lydians penetrated Asia Minor from the north; the Greeks and other seafaring peoples fell upon Asia Minor's coasts. The Etruscans also seem to be descended from a seafaring tribe as suggested by the Aeneas saga, which is linked to the founding of Rome. 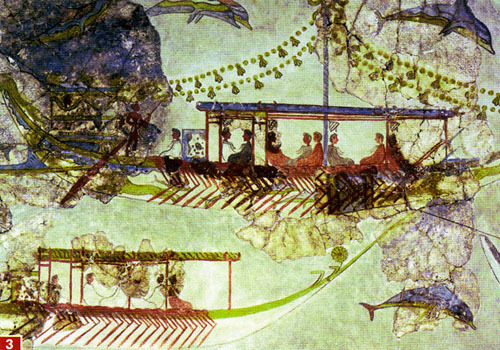 3 Seaborne procession, Minoan mural. 16th century B.C. The most significant equestrian tribes of the period were the Indo-European Cimmerians and 5 Scythians, who advanced out of the Eurasian steppes and into Asia Minor and Iran in the south, as well as modern Germany and Italy to the west. 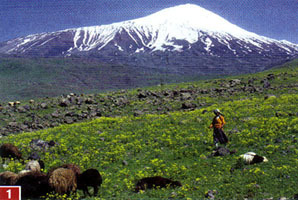 The Cimmerians, who had been expelled by the Scythians, destroyed the Kingdom of Urartu in alliance with the Assyrians. They were then pushed into Asia Minor, where they defeated the Phrygians only to be annihilated by the Lydians. Up until 100 B.C., the Scythians occupied the area of present-day Ukraine, but they were then absorbed by other nomadic and equestrian peoples such as the 6 Sarmatians. 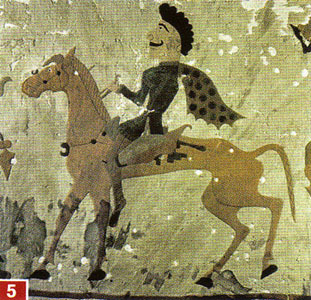 5 Scythian riders, tapestry, fourth/fifth century B.C. 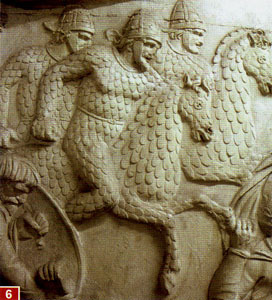 6 Sarmatian horse soldiers in armor on armored horses, Pillar of Troy, Rome, 113 B.C. Some researchers link the Atlantis legend to the emergence of the seafaring peoples. According to this theory, a great natural disaster set off the migratory movements. Today, archaeologists suspect the epicenter of this disaster was the island of Santorini (Thera) in the Aegean. Here, in the 17th century B.C., a volcanic eruption caused a large part of the island to sink into the sea. Underwater earthquakes and the fallout of ash affected the whole region and might have forced the inhabitants to flee in a long-term migration.